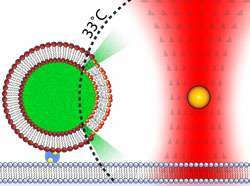 Tiny gold particles are heated using infrared light from an optical tweezer and the hot gold particle is brought closer and closer towards an artificial cell membrane. When you know how the lipids melt you can observe them and calculate the exact temperature of the particles. Tiny gold particles are good for transferring heat and could be a promising tool for creating localized heating in, for example, a living cell. In new experiments, German researchers at the Niels Bohr Institute have measured the temperature of nano-sized gold particles with extreme precision and have examined their ability to melt the lipid membranes surrounding cells, paving the way for dissolving sick cells. The results have been published in the esteemed journal Nano Letters. Gold nano-particles have a strong interaction with light in relation to their size and it is precisely their physical size that gives them different colours. Its colour is the result of how strongly a gold particle scatters and absorbs light at different wavelengths. Therefore, when the light heats up the gold particle, the colour has significance for its temperature. The research was conducted in the Optical Tweezers Group at the Niels Bohr Institute. Optical tweezers are sophisticated instruments, which using an extremely focused laser light can trap and hold gold particles on a nanometer scale. A nanometer is a thousandth of a millimeter and therefore very small. The gold particles are between 60 and 200 nanometers in size. "The particles can be heated using infrared light from the optical tweezers and by turning the light up and down you can control the heat", explains PhD student in biophysics, Anders Kyrsting, who conducted the research along with his colleagues from the Optical Tweezers group. But exactly how hot do the extremely small gold particles get? It is important to know the precise temperature in order to have complete control over the situation. The particles are too small to measure directly, so you can instead measure indirectly by their effect. Anders Kyrsting brought the hot gold particles closer and closer towards an artificial cell membrane comprised of lipids. When quite close the lipids melt and if you know exactly when certain lipids melt you can use this to calculate the temperature of the gold particles. It turns out that the gold particles are able to reach several hundred degrees at a light intensity of less than 1 watt. Having a hot particle means that you have a tool that you can use  a tiny little heat source, which is well-defined. By melting the lipids in a cell membrane the cell will be dissolved  killed. But only that cell. "The heat decreases so rapidly that at just a radius of a gold particle from the surface, the heat is half the temperature than it is at the surface. That is to say, that a typical cell length away from the particle the heat will have decreased so much that it is harmless", explains Anders Kyrsting. "The technique can also be used as a tool for changing temperatures in a few microseconds. When the temperature from the surface of a heated gold nanoparticle decreases several hundred degrees per micrometer, it is, for example, possible to have two separate states  a liquid and a more solid form in artificial cell systems consisting of small lipid vesicles. Here the border surface between the two states will be very clear-cut, which is useful if you want to study cell membranes", explains Anders Kyrsting.